How Soon is now? What does this mean and what has it got to do with architecture? 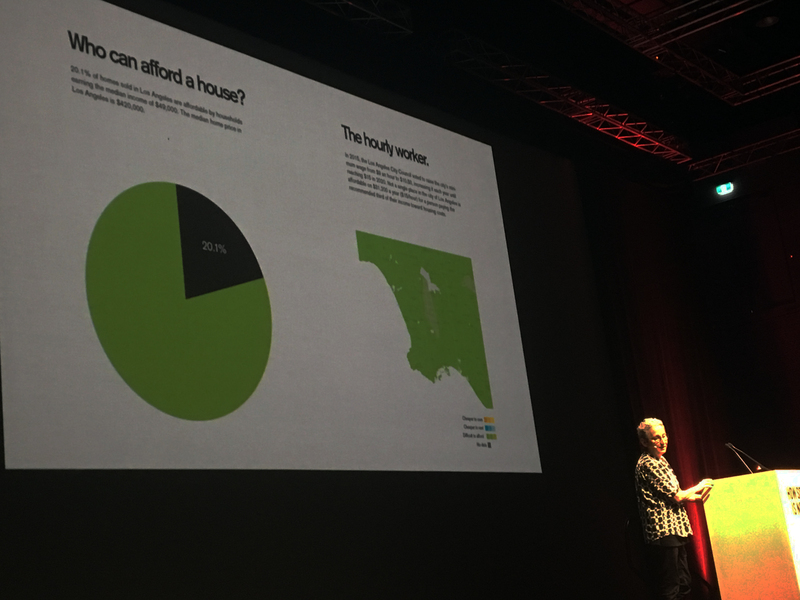 Day 2 of the Australian Institute of Architects National Conference kicked off in earnest with a full day of talks at the Adelaide Conference Centre. Opening the conference was National President Jon Clements, who took the opportunity discuss the proposed governance changes at the Institute before handing over to Senior Cultural Custodian, Karl Winda Telfar, for the welcome to country. Next up, it was time for the creative directors to put forward their vision for the conference. 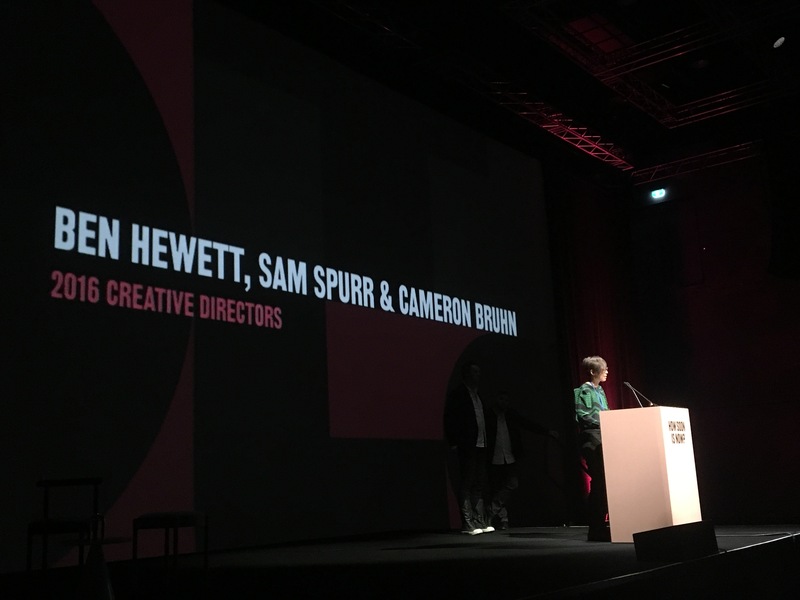 Ben Hewett, Sam Spurr and Cameron Bruhn formulated this conference to be a discussion about what was happening now, that would be shaping our future. As Spurr commented, this conference would be less about walking through buildings and more about agency and ways the diverse ways of working to achieve excellent architecture. First of the keynote speakers was Nasrine Seraji from Atelier Seraji Architects and associates. This enthralling presentation was hard to pin down to a single idea. Instead it was part history lesson part critique of the architecture profession, part exploration of a body of work. It must be said how perfectly Seraji’s presentation tied into yesterday’s Parlour discussion on women transforming the city, noting that clients of women architects often presume them to be good at domestic architecture simply because of the assumption about how women spend their time. Her concluding remarks about the late Zaha Hadid, proving that architecture was indeed a man’s world, hit a chord for many in the auditorium. Next to the stage was Vicente Gaullart who was the chief architect of Barcelona City from 2011-2015. In Barcelona, work is underway to develop the self-sufficient city block, capable of providing its own power, water and even produce food. These sufficient blocks make up neighborhoods of a very walkable size. The city then is made up of a network of these neighborhood groups. This networking model then has an inbuilt level of resilience and sustainability, with high quality architecture and design happening at every scale. During Gaullart’s time as Chief Architect, Barcelona undertook some very clever strategic infrastructure initiatives which will set the city up for the 21st Century. Most notable of these were the provision of digital fabrication labs within neighborhoods of high unemployment. These community facilities offer people the opportunity to retrain and upskill, whilst also providing a creative outlet for the citizens. Another notable initiative was the street WIFI network which was prototyped and then installed into street furniture throughout the city. The uses of this system are flexible but it is envisaged that the connectedness between data and place will help future technologies like self driving cars become a reality. Next up was Sadie Morgan, co-founding director at the London-based dRMM Architects. Most recently Sadie was appointed the Design Chair of the High Speed 2 (HS2) rail project in London. This project is immense. It will be the largest ever infrastructure project in London’s history and has a project delivery timeframe out to 2033. Her task as she described it will be to inject high quality design throughout the project. This goes far beyond just the stations to include the cuttings, fences, signage and websites. Once again the experience from the overseas example rang loud and clear for Australia’s cities. Questions of how to deliver our big picture projects, whilst fighting bureaucracy and keeping the politics out of the decision making could be equally said of the Melbourne Metro Rail tunnel or even the often discussed east coast high speed rail. From London it was across to New York as Jeffrey Shumaker, the Chief Urban Designer for the New York City Department of City Planning took the stage. In another content rich presentation, Shumaker discussed the trends developing and decisions that were being made in New York. Perhaps the overarching theme was how to bring equity into the city. Again the audience was nodding with agreement when Shumaker proclaimed that when it comes to apartment housing, we need to be talking about quality and affordability not just quantity. As far as the trends go, New York is also undergoing a major shift away from cars as a mode of transport. This places a high priority on the need to rebalance streets to prioritise the pedestrian experience over the car. Amongst the other priorities, New York has 700 linear Miles of spaces under infrastructure. Work is underway to carve out public space from these underutilized spaces, to provide public benefit. From New York it was across to Los Angeles with a discussion from Julie Eizenberg from Koning Eizenberg Architecture. Again the narrative was familiar to Australian cities. Speculative housing locking out all but the wealthiest causing a crisis in housing and Baby boomers not comfortable with change. The eerie similarities continued when Eizenberg brought up the difficulty in getting support for apartments without car parking in Santa Monica. For anyone watching the progress and the difficulties faced by Breathe Architecture in getting approval for the Nightingale Apartments in Victoria, this would no doubt have sounded all too familiar. After lunch things seemed to slow down a bit from the earlier discussions on cities. In the session entitled Culture and Development, John Wardle from John Wardle Architects, Greg Mackie OAM from the History Trust of South Australia, Andrew Beer from the University of South Australia and Sharon Mackay from the South Australian Government’s Department of Premier and Cabinet talked about various aspect of culture and the built environment. Each of these presentations was interesting in their own way, however many in the audience were hoping for more of a discussion between the speakers. Perhaps the highlight of the session was Andrew Beer breaking down some of the emerging trends in Australia’s demographics and how this will challenge our cities. Next up was David Sanderson, Chair of Architecture at the University of New South Wales. This talk centred on humanitarian aid efforts in response to disasters, was presented masterfully. Most notably Sanderson highlighted that the current aid model is based upon a rural response. The very notion of ‘field-work’ highlights how we think about aid. In reality however what is needed is neighbourhood work, because with a rapidly urbanising population, this is where the majority of the need lies. To close out the talks for the day, a panel of critics sought to provide connections across the speakers, whilst providing some critical analysis of the material. It was a very tough ask, but provided a few questions for the audience to ponder. Later that evening, across the river at the Adelaide Oval, the 2016 Australian Achievement in Architecture Awards took place, with the founding directors of ARM Architecture being awarded the RAIA Gold Medal. Congratulations to Stephen Ashton, Howard Raggatt, and Ian McDougall for your lifetime of achievement. Congratulations also to Jeremy Macleod of Breathe Architecture for being awarded the leadership in sustainability prize for his work on Nightingale. How Soon is Now? More to the point how late is now? 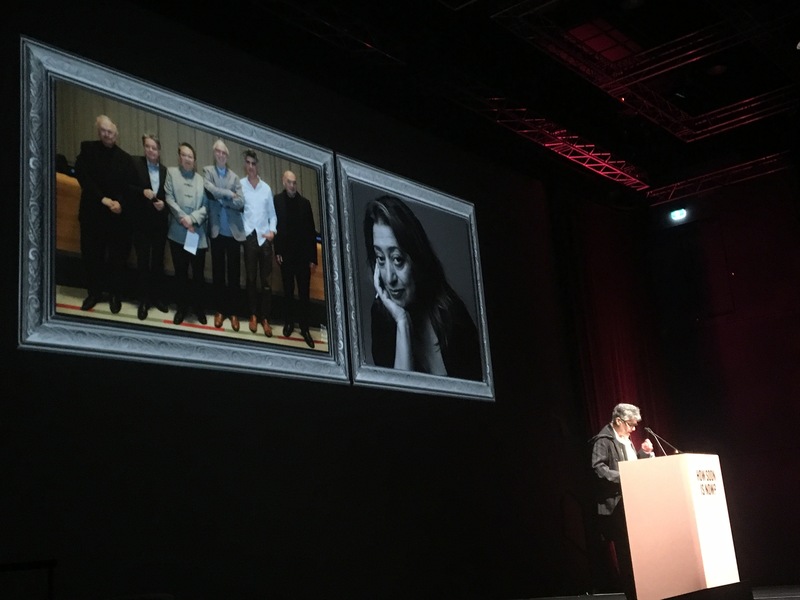 This entry was posted in 2016 Architecture Conference, all posts, awards, Gender Equity in Architecture, News, Uncategorized, Urban Design and tagged Andrew Beer, Atelier Seraji Architects and associates, Australian Institute of Architects National Conference, Ben Hewett, Cameron Bruhn, David Sanderson, dRMM Architects, Greg Mackie, How Soon is Now, Howard Raggatt, Ian McDougall, Jeffrey Shumaker, Jeremy Macleod, John Wardle, Jon Clements, Julie Eizenberg, Karl Winda Telfar, Koning Eizenberg Architecture, Nasrine Seraji, Nightingale, Sadie Morgan, Sam Spurr, Sharon Mackay, Stephen Ashton, Vicente Gaullart, Zaha Hadid. Bookmark the permalink.